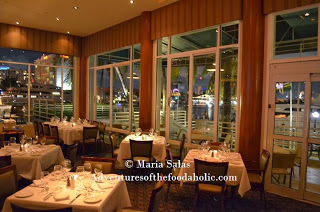 For my second Dine Out Lauderdale adventure I headed up to Grille 66 & Bar, located adjacent to the Hyatt Regency Pier 66 Hotel at 2301 Southeast 17th Street. The first few steps in, I was already enthralled with the panoramic views of the intracoastal waterway. Floor-to-ceiling windows and strategically placed outdoor seating provide guests with an unparalleled dining experience. The elegant yet inviting atmosphere is enhanced by the traditional decor. Although the place is large, the surroundings still exude a sense of intimacy and individuality that adds to its allure. Service was top-notch from beginning to end and we enjoyed sipping our nice vintage while we perused their Dine Out Lauderdale menu. The menu has a nice selection of courses. For starters, we chose the Sesame Crusted Rare Tuna, served with julienne vegetables and a tamari vinaigrette for dipping. The tuna was fresh and tender and I loved the way the roasted-nut and citrus flavors of the vinaigrette incorporated an Asian kick to the dish. We also ordered the Petite Maryland Crabcake with Roasted Sweet Corn. Oh wow that was lick-your-plate good! The taste was accentuated by a jalapeno relish and sauce remoulade. Because Grill 66 & Bar is known for its prime meats and fresh seafood, we decided to go with both. As entrees we ordered the Petite Filet Mignon and the Grilled Shrimp and Sea Scallops Brochette. The Filet Mignon was really not petite at all. Barrel cut and served with forest mushrooms and cippolini onions, it was rich and bold in flavor. The creamy, roasted garlic mash served as a perfect complement to the dish. The Grilled Shrimp and Sea Scallops Brochette was impressive. 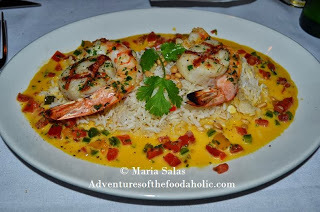 Two beautifully presented skewers of well seasoned grilled shrimp and the most tender scallops I&apos;ve had in a long time, sat on a colorful bed of sweet pepper pignoli, Basmati Rice Pilaf and curry butter. Our sweet finale consisted of a Key Lime Tart topped with fresh cream, and a Double Chocolate Mousse Tort with raspberry sauce. Anytime I see the word "double" in front of the word "chocolate", there&apos;s no need for any further thought process. Both desserts were delicately prepared and plated, and required a few minutes of admiring before finally digging in. The Key Lime Tart was a refreshing and zesty end to the meal while the Double Chocolate Mousse Tort was rich and decadent in all of its layered splendor. Served with berries and a thick raspberry sauce, I smiled all the way till my last bite. 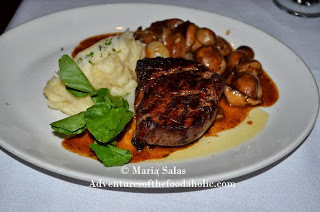 It was an excellent Dine Out Lauderdale experience! For more information on Grille 66 & Bar, or to make reservations, you can contact them at 954-728-3500.